Brand new vacation home. Luxury features throughout the home. Blocks Walk out your door to hundreds of miles of hiking and biking trails in acres of National Forest. Everything in this custom house is premium and over sized. Every room is over-sized, with extra tall walls and vaulted ceilings. Two large decks for al fresco dining and a giant hot tub. Three large private master suites — all three have their own bathrooms, two have their own spa tubs. Plus a bonus room with two sets of bunk beds (so four twin beds) - perfect for sleepovers. Luxury finishes ensure a great stay: hardwood floors, rock fireplace, custom alder wood doors & trim throughout the house. No expenses were spared! Top of the line GE Profile stainless steel cook top, double oven/microwave and ultra quiet dishwasher are included in the custom Coventry maple cabinets with custom granite counter tops in the kitchen as well as throughout the house. HIKING: There is a terrific loop trail that starts from the house for a good evening walk. Walk out the front door and go up April Drive to the top of the loop. Go left and through the gate. Make a right and follow the trail through the woods. Cross the stream and continue on. When you get to the major intersection where the signs are make a left back towards the house. Follow this trail until reaches Heavenly. There is a great lookout here of the lake and sunset from the top of the rocks. You can then head left back to the house where you started. * Note: This home is not rented on craigslist. Please do not get scammed by people on craigslist trying to rent you vacation homes! My family has had a vacation home in South Lake Tahoe since I was 10 years old. 20 years ago, my father moved there permanently. For the past 10 years, my father and I have been building homes in Tahoe and selling them. But this one I built for myself and my family (that's my wife and new daughter in the photo). I work in Advertising in San Francisco and manage other family vacation homes for many years. Location, location, location! We decided two years ago to build a house for ourselves. After months of searching we found the perfect lot. It's near Heavenly Ski Resort (where I've had season passes for many years and from where I can ski from the mountain to the house) and off Pioneer Trail (providing quick and direct access to the Bay Area, the mountains, the lake and the Casinos while avoiding Hwy 50). It also has miles and miles of hiking and biking trails right from the front door. Which was very important to our family. After all, what's a vacation home if it's in the city? Walk out the front door for miles of hiking and biking trails. The beach is less than 2 miles away. BBQ pits, sledding hill in winter, parking, etc. I've skiied home, but can't recommend it as it is out of bounds - the house is that close to Heavenly! Basic cable on every TV in the house, with free hi-speed wireless internet. Bring your Xbox, Roku, or Apple TV - or rent DVDs from the local Safeway for $1/night. There is a lawn in the front yard. But like most homes in Tahoe the backyard is left natural. Off the kitchen/living room with a table and chairs for dining outside. Two mountain bikes with helmets and locks - perfect for riding down to the lake or on the miles of trails behind the house. Brand new, super powerful and big. Free hi-speed wireless broadband throughout the house. And almost every room has a flat screen TV - 4 total. Onkyo stereo system. Everything is included! (except a land line phone as we found no one used one!) HOME BENEFITS - Flat drive and garage so your cars don't get towed or slide away. - So close to Heavenly you could practically ski home. - Drive less as your blocks to Ski Run and the casinos - Step out the door to amazing hiking trails & views - Downstairs media room has it's own TV and DVD player to entertain the kids. - Store all your ski stuff & your cars in the oversize, heated garage. - TV's in almost every room so you can relax at night. This is a perfect house for a family or couples. There is a ton of space. The bedrooms are comfortable and roomy, Kitchen has everything you need. We truly enjoyed our stay and will book here again next time we are in South Lake Tahoe. Beautiful cabin, great location, super roomy and comfortable. We enjoyed the layout and three master bedroom suites. The price was well worth it! The info on the hot tub was conflicting in the book than on the refrigerator so we were unable to access for two nights as the we were using the book’s info. We used it the last night, but it wasn’t hot enough. The stove was a little finicky as was the garage door controls. These were picky little things because it was overall well stocked and super accommodating. I would highly recommend this place! Great place for the whole family! Close to downtown and lots of activities! We were very pleased with the April street house. All 8 of us had enough space to relax as needed. It was great to be able to cook in a big kitchen and to have everyone eat all at once at the same table! We enjoyed the close trail and all the activities that were near by. 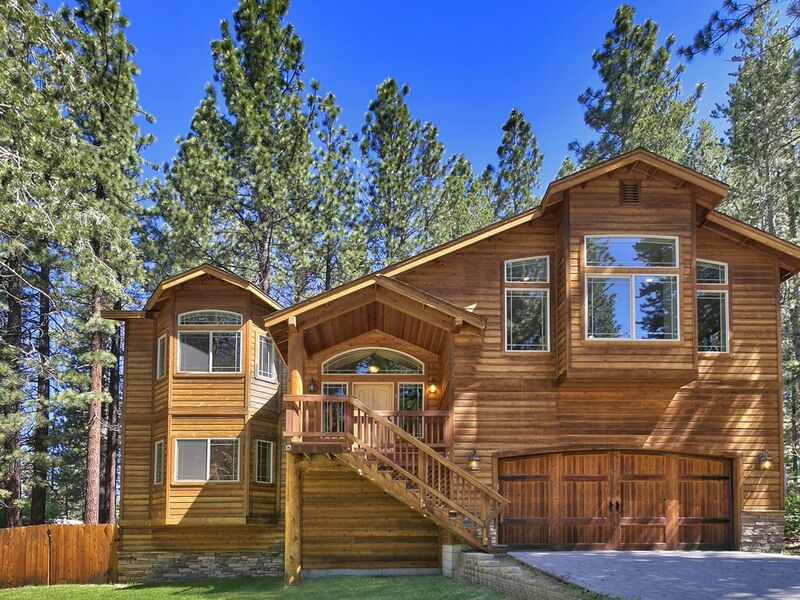 A beautiful home in a perfect location in South Lake Tahoe! Not many homes have 3 masters with bathrooms and a room with 2 bunk beds for the kids. It is the perfect place to bring multiple families! Will definitely be back! The king master bedroom smelled of smoke and the rear sliding glass door would not lock. I immediately called the cell phone number given, but didn't receive an answer. Our party consisted of eight senior female cousins and we were extremely concerned sleeping in an unsecured house. On our last day I called again and spoke to the owner. All beaches are public. Pope & Reagan beach are the best day beaches with BBQs and whatnot. Also Camp Richardson / The Beacon has a great hang out restaurant on the beach usually with Live music + the old Pope estate to check out. This is on the way to Emerald Bay (a great day trip) - stop at the ice cream shop on the corner - it's cheap! The end of Ski Run Blvd there is a long pier and a nice restaurant called the Riva Grill. The Red Hut has great breakfasts (two locations one on the 50, the other on Kingsbury Grade). Rude Brothers Coffee (on the 50 near Al Tahoe) has great coffee and treats. Cork and More has great picnic supplies and wine selection (Al Tahoe near 50). Rates are subject to change at any time as holidays are different each year. While we try to keep rates up to date for the next 6 months, rates further away then that are often wrong as Holiday dates change every year and Homeaway/VRBO doesn't have the ability to edit say XMAS rates for all future years. So instant book rates are subject to change after you book.